Porcelain Fused to Metal (PFM) serves to remain as the most prescribed dental restoration by dentists. 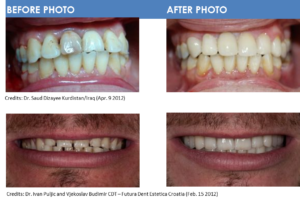 PFM is an integration between an all porcelain crown and a full metal crown producing a natural looking finish. Our expert technicians makes sure the metal shell fits accurately over the tooth, the porcelain is then built up into a tooth structure, and lastly the metal and porcelain is fused together. Fidelity Dental Lab uses the highly advanced porcelain from Noritake. The luster of the Noritake porcelain creates a natural opalescence allowing the crown to blend in effortlessly with the rest of the teeth. Ivoclar Vivadent’s patented lithium disilicate material is truly a revolution for the dental industry. Never before has a material been able to combine high strength, high esthetics and ease of use into one product, until now. IPS e.max is a lithium disilicate glass ceramic that has optimized translucency, durability and strength for full anatomical restorations. Due to the use of new technologies and optimized processing parameters, IPS e.max lithium disilicate has evolved beyond previously available lithium disilicate ceramics. IPS e.max lithium disilicate restorations exhibit superior durability featuring 360-400 MPa of flexural strength. When fabricated to full-contour, the monolithic structure is the most robust ceramic system tested to date. The opalescence, translucency and light diffusion properties of IPS e.max lithium disilicate were all designed to replicate natural tooth structure for beauty and undetectable restorations. From 3M, a quality alternative to generic Zirconia. Utilizes the same CAD/CAM and shade system as Lava™. Remarkable strength (greater than 900 mpa and strong enough for clinical situations with a small occlusal reduction of 1.2mm. At Fidelity Dental Lab, our highly experienced implant specialists are fully dedicated to each implant case from design to fabrication. Implants serves as a root replacement for your missing teeth, and provides strength and durability as it is fused to the jaw bone. Abutments are the connectors between crown or bridge and an implant. Compared to stock abutments, custom abutments are a healthier choice as the precise fit helps maintain soft tissue and even interproximal bone height. Custom abutments also reduce the time a dentist spends on restoring an implant, because it minimizes the need for manual adjustments. Serve patients with customized abutment restorations designed to provide optimal function and esthetics. Straumann® customized abutment restorations used in conjunction with Straumann® implants are designed to achievethe best possible performance in the implant-abutment connection and thus in the entire restoration. Straumann® screw-retained abutments and Straumann implants are engineered to be used together to ensure a harmony of design (shapes and features), tolerances, surface qualities and materials. Customized shape and emergence profile - Customized Straumann® CARES® Abutments are designed to offer patient-specific emergence profiles and anatomical shape to support optimal soft tissue management throughout the healing process. Control over cement gap - As the cement margin can be ideally placed for each case, customized Straumann® CARES® Abutments help in clearing excess cement. Optimized path of insertion - Thanks to the flexibility in design of the customized Straumann® CARES® Abutments, angulations can be tailored to each individual patient situation, within the design specifications. This can simplify the insertion of the final restoration as compared to a stock component. High convenience in the restoration procedure - The customized Straumann® CARES® Abutment is designed to provide accuracy together with time and cost efficiency through the whole restorative procedure. With Straumann® CARES® CADCAM, you will be able to design and offer complex superstructures. Straumann® CARES®Screw-retained bars and bridges allow for individual customization regarding function and esthetics. Direct connection to the implant - The Straumann® CARES® Screw-retained bar or bridge is directly placed on the Straumann® dental implant – the built-in abutment is part of the restoration. No additional components are needed. High precision - The precision of the Straumann® CARES® Screw-retained bar or bridge is based on Straumann’s strong expertise in implantology and CADCAM manufacturing. Extensive mechanical tests and computer simulations will help us to provide you with clear guidance for your design. Designed by experts - The design is entirely guided and carried out by the dental technician, while Straumann takes care of the manufacturing process. Your Straumann® CARES® Service Team - Straumann’s experienced dental technicians provide high-quality restorations and a precise fit of the Straumann®CARES® bar or bridge – all according to the master model. Also go to our Product-related services page for more information on our CADCAM support. Available in two materials. Straumann® CARES® Screw-retained bars and bridges are available in titanium and cobalt-chromium alloy (coron®) for the restoration of Straumann® implants. Learn more about our various material options. High-precision prosthetic elements: your final product needs to meet high quality standards. Straumann® CARES®offers you prosthetic elements of consistently high quality – through its validated workflow with proven milling expertise. And, we back up our quality products through our warranty policy. Greater range of applications and materials: CADCAM is regularly used to produce crowns and bridges, but many of our customers would like to use it for inlays, onlays, and customized abutments. A growing demand for new types of materials is met through our IPS e.max® and 3M ESPE Lava™ Ultimate Restorative offerings. More flexibility: the Straumann® CARES® System 7.0 offers customers the option of proceeding with our Validated Workflow to produce your restoration in our state-of- the-art milling center or an External Workflow to manufacture your prosthetic elements with your milling partner of choice.